Egypt was home to one of the world’s most glorious and enduring ancient civilizations, and its wealth of history, beauty and culture still fascinates. A journey along the Nile, visiting the magnificent tombs and monuments of the pharaohs, is something everyone should experience at least once in their lifetime. Cairo, with its maze-like streets and bazaars and its mix of Roman, Islamic and Christian architecture, is an adventure all its own. And then there’s the Egyptian landscape to explore, from lush desert oases to the coral reefs of the Red Sea. Nothing in stories or photos can prepare you for the experience that is ancient and modern Egypt. 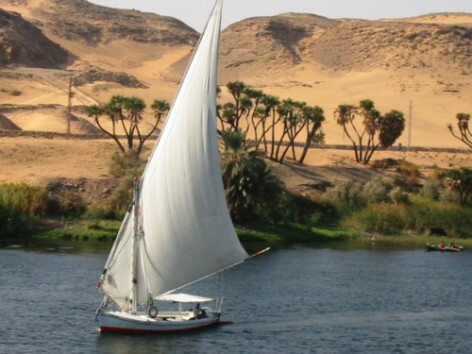 When my husband and I toured Egypt in 2004, we sailed down the Nile from Aswan to Dendera, stopping to explore all the major sites along the way. I felt like I was following the paths taken by Ramses II, Tutankhamen, Cleopatra and Nefertiti. Back in Cairo, we were able to satisfy our passion for Middle Eastern art, architecture, culture and foods. It was such a wonderful trip that we returned this past Christmas with our kids. This time, we stayed in a hotel at the foot of the pyramids in Giza, rather than in Cairo. We spent the Christmas holiday relaxing at our Red Sea resort in Hurghada, then headed for the upper Nile. Over the last year, our kids each studied a different aspect of ancient Egypt, and they were thrilled to see the monuments and hieroglyphics for themselves. Even so, temple fatigue was bound to set in, so rather than a Nile cruise, we chose to fly to a few of the most important sites. On this trip, we also added a visit to Jordan – it was a great decision. The famous Wadi Rum took our breath away, with its rock formations carved by centuries of wind and rain, looking like dripping sand. We saw a crusader castle along the King’s Highway, and Greco-Roman ruins in Jerash. But the highlight of the trip was Petra, the ancient city carved from stone. It was even more incredible when we toured it by candlelight, and its mysterious history really captured our imaginations. We plan to go back to Jordan in the warmer months for an excursion at one of the desert camps.